Ok added the feedback for the VSWR, rig PSU and smeter. I will have to play with the callibration of the smeter but that should be easy enough. Right now just the voltages are displayed as I will need to refine the amplifier and/or voltage divider networks correctly to get them right. When that works I'll flip the smeter over to bars running againt the meter scale on the second row. The vswr also should update the power out level. The ADC are only running as 8bit which seems to be more than enough, will be using a 5V reference (4.913V or something like that). The way it will work is a voltage (in volts) for the S-meter output of the receiver for each S meter reading was be measured. Then I could use the ADC value to determine the s-meter reading. An alternative is I might use the method qrp2004 applied and not bother with any of this and just record the S9+20 level as the maximum signal and the S0 level as the minimum signal. You can then use fractions of the voltage at S9+20 stored in a lookup table for the different smeter values and the the S-meter reading can be determined. The reason why this might be better is that you can callibrate the smeter. It is probably all relative anyway. The PIC mikrobasic isn't rocket science. I basically have signals coming into PortA.0, PortA.1 and PortA.2 of the PIC16F877A which are operating as ADC and that converts the values. 'volt meter NB right now FSD is 4.99V! 'smeter NB right now FSD is 4.99V! 'vswr NB right now FSD is 4.99V! Now trying to figure out the I2C or SPI routines to control the DSP and DDS as they will be on a separate dsPIC and PIC or AVR. 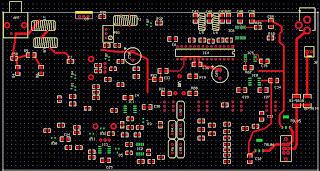 The control project is a little way off complete and circuits are still all over the place and got to pull it together into a single PCB but I seem to be getting there. Once complete and if I turn it into a kit and anyone interested in building I will try and obtain a few more of the 2x40 displays. But back light versions. I have to find some foil for a backlight yet for the current version, I did have fun modifying an old 2x16 without back light using 1mm perspex and 4 blue LED which worked! I was running out of space on a 2x16 LCD and a menu scroll etc was a nightmare to implement so remembered the 2x40 displays from W8DIZ and gave them a go. Anyway this is the mock up (I have used a EasiYo yoghurt cardboard box as it is a great size for the final rig) of the display and panel, not added the push bottons or rotary controllers yet. There are 12 buttons and 5 rotary controls. I bought 10 push button rotary encoders off ebay for <£1 each so some might be combined. RX signal is +40dB, the enabled option switches (should not have VFO A and VFO B shown should be one or the other! ), PSU voltage, output power level set (the S meter area will do duty as a modulation meter on TX), IF crystal filter enabled although I need to implement the BW as using a variable band width crystal filter 400Hz to 2.8KHz the power output area will double up to display the BW on TX. Some options can appear to be seleceted even though on RX. This a bug in the firmware. There seems to be plenty of extra 'LCD real estate' left. If need it might remove the M1KTA bit too. The little man to the right of M1KTA is aa bit of fun and is the identifier for rig tuning speed. He runs from left to right and back again. The faster he runs the faster the tuning. If LOCK is enabled he stands still and there is a stop sign. Here is a little video of it, normal, lock applied and then fast tune. The ticks will be on the panel but the LCD show which controls are active, I used character $FF to display the option if enabled which is just a filled block, I might change this and the list. Modes are C (cw), S (ssb) maybe U (usb), l (lsb), P (psk). The rig is AD9851 DDS with DC RX standard NE602, Crystal IF and/or dsPIC DSP and LM386 chain. TX is direct from DDS (CW) or SSB rig using a combination of ideas from KK7B, KD1JV, G4GXO etc... to be honest what worked and I had components for. I think I can have RX different to TX but not implementeted it. When works will also add isolated audio outputs for computer connections and possibly SD card recording capabilities. The original idea was to create a HB-1A/KX1 clone but I added SSB and PSK. OK played abut a bit more with the PIC 16F877A and got most of the commands working for the VFO, dropping the dual VFO for the moment as think might have to go to dual PICs for that.
' This is ADC interrupt handler.
' Analogue input is sampled and the value is stored into input buffer.
' Input buffer is then passed through filter.
' Finally, the resulting output sample is sent to DAC.
' This is Timer1 interrupt handler.
' 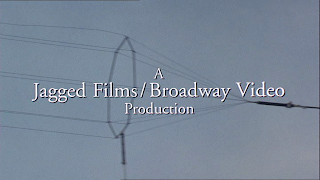 Main program starts here.
' the program goes to an infinite loop, waiting for interrupts. PR1      = $03E8                       ' Sampling = 20000 Hz. Value of PR1 is dependent on clock. Starting to put together code for DDS using a rotary controller. Using AD9951, PIC 16F877A, a cheap £1.09 ALPS encoder from Farnell, a 2x16LCD and a keypad £3 from Maplin. 1) DUAL VFO, that is VFO A, VFO B and A=B facilities. 2) UP to 50 spot frequency stored in MEMORY. a) DIRECT where the frequency output has no offset displayed. b) VFO MODE, where a frequency offset (IF) is applied VFO+IF, VFO-IF, IF-VFO). While in this mode, VFO A or B is displayed on the top line of the LCD. b) MEMORY MODE, where the encoder is used to select a previously saved frequency. While in this mode, MEM is displayed on the top line of the LCD. 4) KEYPAD Frequency entry and additional 7 Press buttons for other functions. The remaining Functions included in the KEYPAD itself. 5) UP/DOWN fast search in three different steps using KEYPAD which is user selective. 6) SCAN and quick UP/DOWN search in three different steps with auto Repeat on PTT. and the # is used to ENTER the completed frequency. If the first digit entered is the #, the number entered will be negative. 8) S- Meter reading from S0 to S9+40db in logarithmic db range. 9) Variable rate tuning to use cheap mechanical encoders. 10) Step size can be changed from 1Hz to MHz range. 12) VFO copy to MEMORY and from MEMORY to any VFO (A/B) facility. 13) AM/LSB/USB/CW modes Operation with PIC pin outputs for switching. 15) 10 RX BANDPASS filter selection for RX coverage from 1.5MHz to 30MHz. Usefull to set up an All band RX. 16) BAND PASS filter switching selectivity 1Hz and 1ms switching speed, which allows cross band Operation. 17) CW OFFSET adds to TX Frequency when transmitting thus avoids modulated CW. 18) Save to MEMORY and Copy from MEMORY functions. 20) Time out function for ignoring any wrong entry in system settings. 21) Auto repeat function for respective keys. 23) Menu screen allows user to change any settings in the setup screen. 24) All settings can be changed in the SETUP screen at any time even when the DDS is in working mode including DDS chip type and Reference Clock. 26) CW OFFSET adds to TX Frequency when transmitting thus avoids modulated CW. Coding PIC with MikroBasic from www.mikroe.com which creates asm which I then can compile with MPASM to HEX and burn to PIC. Some code started out life as examples from them. 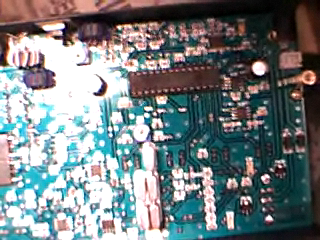 IF (PORTA AND 2) XOR b_old <> 0 THEN                'test for encoder change on "B"
' Port B KeyPad, pins pulled LOW ! ddswrite(cfreq)                      ' Two writes to set registers ??? ddswrite(cfreq)                     ' Two writes to set registers ??? ddswrite(cfreq)                      ' Two writes to set registers ???? 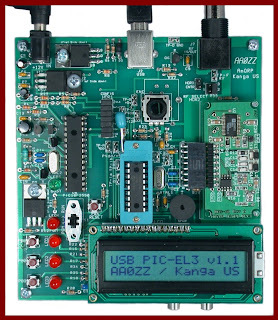 Thought I'd a have a bit of fun and look at the new USB capable PIC EL -III kit from AA0ZZ. Extra update sent a set of three knobs from G3WXI, not the latest run he did but NOS and they look fine... Will fit when re drill the holes as bit small on front panel. Ok going to have a bit of fun and rework the design starting off with reworking the pcb layout and will add in what I know works for psk and ssb. 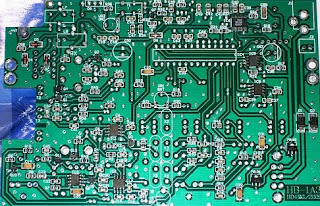 Will use Express PCB as a layout as i will create the PCB with Blue press n peel film. I asked someone who has one to show it on a web cam as I wanted to get some decent images of L7 and L8 and T1, T2 and T3. L7 and L8 are the output filter and are l7 0.6uH and l8 0.5uH the HB-1A uses little 1cm OD, 0.5cm thick, 0.5cm hole ferrites. l7 is 10T and L8 is 11T of what looks like simple hook up wire. I probably should not have worried hough... KX1 uses same design and the details using T37 cores are in the docs. T1 uses the same core and the critical information is that the windings are Primary 7T and Secondary 2T. I also have a better idea of the through hole components on the SMT IC side. The PIC is socketed and there are no in circuit programming connections. IC7 the keyer chip is placed on the reverse. The 4 sets of 6 holes are the four switches from the front. I built a PFR-3 and KX1 already (PFR-3 on this blog) and I never considered those to be identical rigs although fulfilling similiar use as /P portable rigs. So I thought I'd have a look at what all the fuss was about as some claiming the HB-1A to be very close to the Kx1, and about 1/2 the price. 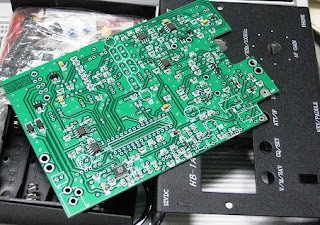 JN1GLB photo of the rear of the board. The KX1 and the HB-1A do share a lot of similarities, but the SA602 and LM386 AF chain is not exactly unique to either. Both do use a AD9834 DDS with 50MHz clock but that again appears in a few places. The HB-1A using a split 2 PIC design with a main DDS/rig control PIC 16F73 and a separate keyer chip PIC 12F629, the KX1 using the single PIC 16F876A to accomplish both. The mute in KX1 comes from RA4 / 16F876A the HB-1A uses pin 8 /PIC 12F629 keyer. The KX1 mute circuit one uses a pair of J309 HB-1A uses a single 2N7000 to interrupt the AF. If you are going to mute the RX then you have to switch off the input to the LM386 somehow. However, the HB-1A adds an extra mute after the Lm386 as well and the tone output from the pin 5/ PIC 12F629 feeds to the phones. 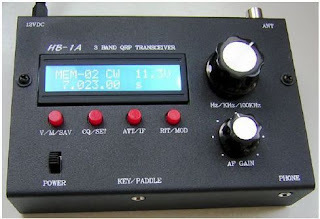 The KX1 feeds the side tone pitch and level from 16F876A (RA5) . The HB-1A has a very similar IF filter with 4 common 4.1952 MHz crystals. The KX1 IF being at 4.913MHz. 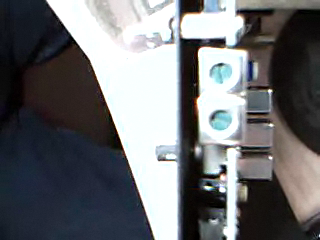 The filter band width is controlled by a rotary pot in KX1 but through the PIC 16F73 in HB-1A. The HB-1A used SMT components throughout. KX1 through hole. The HB-1A reports battery voltage and the frequency display is to 5 signifiant figures (10Hz resolution). KX1 to 1kHz resolution. I find the HB-1A interesting as I have many of the components in the junk box (and in SMT form!) and I have a couple of spare keyer PIC 12F629 and a selection of PIC/AVR AD DDS chips and some Si570, perhaps an alternative homebrew version of this might be a fun project. OK made new panel today and transfered loads over to it, using 6BA bass fixing too. The dead head caps also started to transfer the attachments from others I have so that the lock nut ones i have used (actually 200pF not 100pF) now work. Missing the RX dial control, will mill a M12 nut and bolt shortly. The views were amazing, btw this is a road in the middle of the day, busy hey! HB0 operating, note the high gain antenna! Another view of the campsite, the washing line is the W3EDP antenna! The swiss park caravans under these little garage things so can use them in winter when lots of snow. HB0 castle on edge of country. Now this is a nice cycle lane! Got to do some more of that radio stuff... NB the solar panel in the sun on front pannier! Winter barns... all empty at this time of year. There was nothing on the cycle path 10 minutes before this. And dragged the derallieur across into rear wheel... bending post! So quickly took train back to Zurich. Now this is how travelling by train and bicycle should be done in UK IMHO! Whilst bike being fixed walk up hill over looking Zurich. Dunno why took these photos!